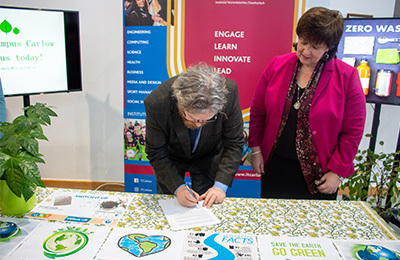 Institute of Technology Carlow today officially signed up to the Green Campus Programme, an initiative to develop smarter sustainable campus communities. Run by the Environmental Education Unit of An Taisce, the Green Campus Programme encourages practical environmental education and the empowrment of campuses to become exemplar in environmental stewardship. There are currently 27 campuses and hospitals formally registered on the Programme, ten of which have been awarded the Green Flag. Research by An Taisce shows that stakeholder-driven approaches to environmental management, as facilitated by the Green Campus Programme, benefits the environment, campus management, students and learning, as well as the local and wider communities. The Carlow Campus is registering for the Green Campus Programme under the theme of Litter and Waste. It is a seven-step programme and the Institute will be looking at ways to improve its waste management and engage students and staff in initiatives to reduce the levels of waste currently generated. Speaking at the signing event today, Bernardette Power, Green Campus Chairperson, commented, “Institute of Technology Carlow joining the Green Campus Programme is a really positive step for both the Institute and Carlow town meeting some of the environmental challenges of the present and future, including waste management and climate change. Many third-level colleges in Ireland are already signed up to the Programme and we now have the opportunity to assess the kind of environmental action already happening on campus and design new approaches to making IT Carlow a sustainable organisation”.